I was lucky enough to receive a copy of this book from Bloomsbury, and I absolutely love it! When three dwarves go in search of 'the finest silks of Dorimar' to give to the queen as a wedding gift, they discover that on the other side of the mountain there is some sort of plague affecting the land. While stopping by a village inn, they are told that this sleep is sweeping across the land and is making everyone fall asleep. Some say it was caused when a witch cursed a princess. Meanwhile, the queen is about to get married but she's not excited. Actually, she's not even looking forward to it. So when the dwarves tell her what they have found out, she decides to trek across the land to rescue the sleeping princess and stop the sleeping plague. The three dwarves and the queen make their way towards the castle, and find it hidden behind overgrown thorns. Everyone they cross is asleep. No one is dead, but they are all in limbo. So when they reach the top of the tower, they think they've discovered the answer to this problem... and instead find something a lot more twisted. This is another awesome Neil Gaiman book. It's short, but it packs quite a punch. It features two very familiar fairy tale characters, and then spins our familiarity with them upside down to deliver a very twisted tale of power and corruption. It also ends up being a story about facing choices. 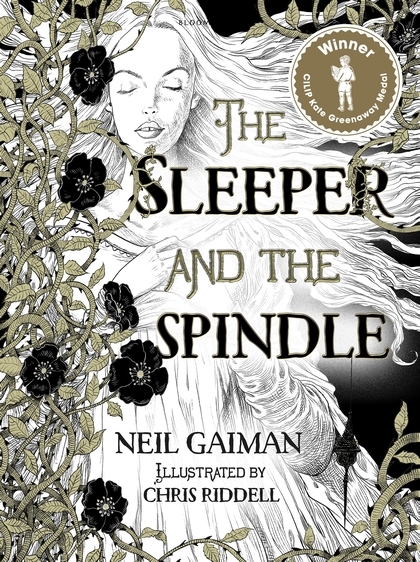 The Sleeper and the Spindle was a dark and very clever reimagining of two fairy tales. I love the strength and wickedness of the females in this story, and that a prince isn't the one who takes charge. The illustrations that accompany this wonderful tale are gorgeous, and enhance it. The actual book is beautiful, a treasure that I can't wait to add to my bookshelf.